Study this amazing snapshot taken by my friend Deepanjan Ghosh. It has literally frozen a couple of nano seconds for eternity I would say. The dragon fly so delicately poised at the end of a long pole, its transparent gossamer wings contrasted with the powerful big blue beyond, is the very picture of fragility. I see this picture for what it stands- the fleeting fragility of hours, the often disconcerting fragility of human existence and of course, the frustrating fragility of relationships. Imagine yourself making the daily commute home- a public mode of transport maybe, packed to its gills and you are trying to do just one thing, survive and get home. Yet in that entire melee, if you ever ridiculously mused upon yourself, and your place in this great Charade we call Life, what would you consider yourself to be? Hmm- do you realize you are in essence a cooperative housing society of over a billion cells pulsating to one rhythmic beat, set into motion the moment an egg and a sperm found each other rather miraculously? And if the genetic configuration tweaked itself a little this way or that, you would have been a completely new person, isn’t it? So this is, in a nugget, a lesson on fragility. So what to do about this fragility I may ask? Yes, we may treat ourselves a little more kindly, nurture our relationships a little more carefully, and savour the moments as they tick by, to wrought changes we can anticipate but cope with some tardiness. Our lives being so tyrannised by Time, I have often questioned the need to invent finely calibrated time. Have we invented Time or does Time make us? -changing our realities and our contexts every moment, taking full advantage of the fragility of our existences. We are so susceptible to change, and that makes us paradoxically fragile and durable. We are frangible beings- “frangible”- easily breakable but with the almost magical Lego-like adaptability to build ourselves out of yesterday’s Plan B. I love ourselves for this resilience, I love Life for giving us that potential but the catch is, it has always been up to us. So many make the change and move on, while some are still holding back to things that have changed a long time ago. Beliefs, institutions, morality, socio-political convictions, economic principles are all as fragile as the glass in your hands. But one look at the world we live in tell us how out of sync we can be as a species- we have men in space but still fill in details of caste and religion in important looking forms, our women engender the future but are themselves killed in the womb, our Gods speak the same language but we insist on remaining residents of the Tower of Babel. We equate refusal to change with strength and immortality- but there is no greater lie than this. Q.E.D- We are a fragile organism. 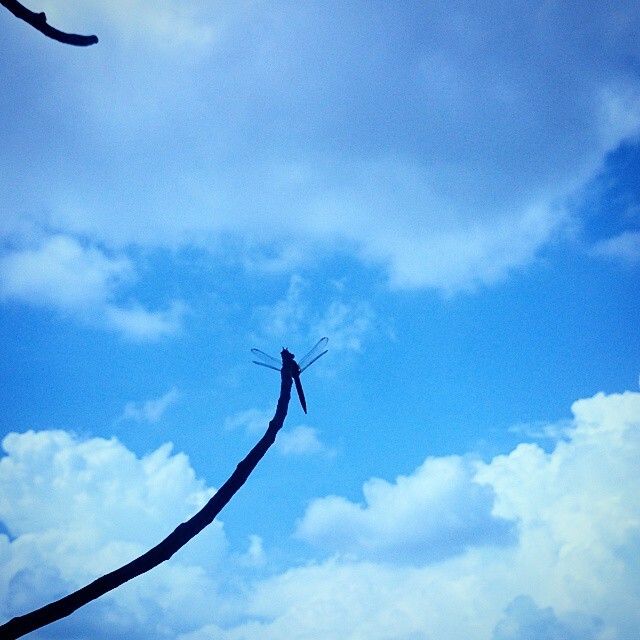 So now, even our Mr Dragonfly-at-the-end-of-the-pole does not seem fragile. A dragonfly will not be able to be anything else or behave in any other way, except as a dragonfly. That is its strength and its weakness. But we change, we are fragile- breakable, brittle and that is not a bad thing at all. This entry was posted in Uncategorized and tagged #dragonfly, #fragile, #frangible, #life #tower of Babel, #time. Bookmark the permalink.